Privacy and serenity combine with a cosmopolitan flair at Four Seasons at New Kent Vineyards. Developed by K. Hovnanian, this age-restricted enclave of the master-planned community of New Kent Vineyards will be comprised of 1,450 residences upon completion. Buyers can choose from ten home designs. Four Seasons is open to residents aged 55 and better. They have use of all the amenities at New Kent Vineyards, which include a winery as well as a Rees Jones championship golf course. In addition, Four Seasons will have its own private clubhouse. The community clubhouse is exclusive to Four Seasons' residents. It includes an exercise room center, a catering kitchen, and meeting rooms. The community grounds will also include a pool. Residents have use of New Kent Vineyards' 18-hole golf course and Viniterra Golf Club. The course was developed in an environmentally friendly manner by maximizing water resource protection, and it winds among working vineyards. Homeowners also have access to the renowned New Kent Vineyards Winery. At the winery, residents will find it easy to stock their wine racks or cellars by utilizing special discounts on fine vintages like Vidal Blanc, Chardonnay, Norton and Cabernet Franc. K. Hovnanian offers ten luxurious main-level living home designs with 1,434 to 3,238 square feet of air-conditioned space. The biggest model has four bedrooms and three or four baths. Five of the plans have two bedrooms with two or three bathrooms, and the remaining five have three bedrooms with two or three bathrooms. The single-family homes at Four Seasons boast gourmet kitchens and luxurious owner suites. All plans have optional dens and feature two-car garages. New buyers can also opt for lofts. The interiors are appointed with crown moldings and other lavish details throughout. Rooms are airy with 9-foot ceilings and have plenty of natural light. Four Seasons at New Kent Vineyards offers a million-dollar lifestyle without the million dollar price tag. Here, residents experience a connection to a real neighborhood with exciting activities that are unique to the community. Whether going to a wine tasting at the on-site winery or pairing up for a golf match, it is easy to make the most of life here. Located off exit 211 on I-64 in historic New Kent County, Four Seasons is within proximity to many urban amenities, airports and a host of attractions in the greater Richmond area, Petersburg and Colonial Williamsburg. Major highways include state routes 249, 155, 106, 33 and 30. One of the main attractions in New Kent is Colonial Downs, home of the famous Strawberry Hill races, only 10 minutes away. Other popular destinations in this culturally rich area include New Kent County Historical Society, Pamunkey Indian Museum, Martha Washington's Birthplace, St. Peter's Church and The Wilson House. Richmond International Airport is about 20 minutes away from Four Seasons at New Kent Vineyards. Four Seasons offers amenities exclusively to its active adult residents. Check back soon for more information on the lifestyle in Four Seasons at New Kent Vineyards. K. Hovnanian offers 11 luxurious main-level living home designs with 1,434 to 3,238 square feet of air-conditioned space. The biggest model has four bedrooms and three or four baths. Five of the plans have two bedrooms with two or three bathrooms, and the remaining five have three bedrooms with two or three bathrooms. The single-family homes at Four Seasons boast gourmet kitchens and luxurious owner suites. All plans have optional dens and feature two-car garages. New buyers can also opt for lofts. Please note that the Pepperhill floor plan and basements are available on a resale only basis. Aesthetically pleasing neighborhood loaded with friendly people. The pool rules are there for the residents. We knew the rules when we moved in. I too have children and grandchildren and it’s never been a problem. We thoroughly enjoy the community. So happy with our choice at four seasons. Very quiet and perfect for retired couples. We truly enjoy our neighborhood and beautiful scenery. THE POOL RULES NEED TO BE FOLLOWED , WE ARE VERY HAPPY HERE. ALL THE RESIDENTS ARE VERY FRIENDLY , THE ABOVE COMMENTS COME FROM A NON RESIDENT. Giving this community one star because of the pool issue is unfair. I have lived here for 2 years now and love it. Everyone is very welcoming, the clubhouse is beautiful and you cant beat the location near Richmond. I couldn't have asked for a better place to live. It is not a child friendly environment. My husband and I have several children and we took them to visit their grandparents there and we were informed that we had too many of us so we could not go to the pool any more, unless we went in shifts so no more than 4 of us were allowed at the pool at a time. We have been before and there is hardly anyone ever at that pool. DO NOT LET YOUR PARENTS MOVE THERE IF YOU ARE MARRIED AND HAVE MORE THAN 2 CHILDREN. At the moment, a small community but growing rapidly. Lovely setting, great neighbors and a housing staff that will work with you and try to solve every problem. I have to say that we really haven't had any. We are close to closing on our home , so far all is well.The staff is willing to help and the constrution is very good. The neighbors we have meet are very nice and seem to welcome us with open arms. We want to close end of Sept. or early Oct. but with all the activity might have to wait. This is a great neighboorhood for active adults. The houses are well built and very low maintenance. Everyone was extremely nice and helpful from purchasing to closing. It was a great experience. I am so happy that I chose Four Seasons and made the move I haven't stopped smiling. Four Seasons at New Kent vineyards has exceeded our expectations as an active adult retirement community. As a first time home builder, we found the sales team professional and understanding, the interior design center staff patient and accommodating, and the onsite construction management team responsive - always ready to provide assistance. We believe the various home options that are offered are very attractive, functional, and energy efficient, with well-designed landscaping. Construction quality is outstanding. The location is ideal too - all the advantages of rural living with big city attractions nearby (Richmond and Williamsburg). For the historian, the area offers myriad opportunities to learn about our country's birth, as well as the revolutionary war and civil war. We found living practically on an award winning vineyard and winery has its advantages too! A great place to enjoy retirement years! If you are 55 and older, and looking for a quiet community with incredible neighbors at an unbeatable price.......look no further.........Nestled between Williamsburg and Richmond, this is an amazing find. Great amenities and tremendous service. I moved to Four Seasons at New Kent Vineyards almost a year ago and have been very pleased with the move. Neighbors are congenial and the developer is helpful with assuring that my house is what I expect it to be. While New Kent is in the early stages of development, I have found needed services not too far away. 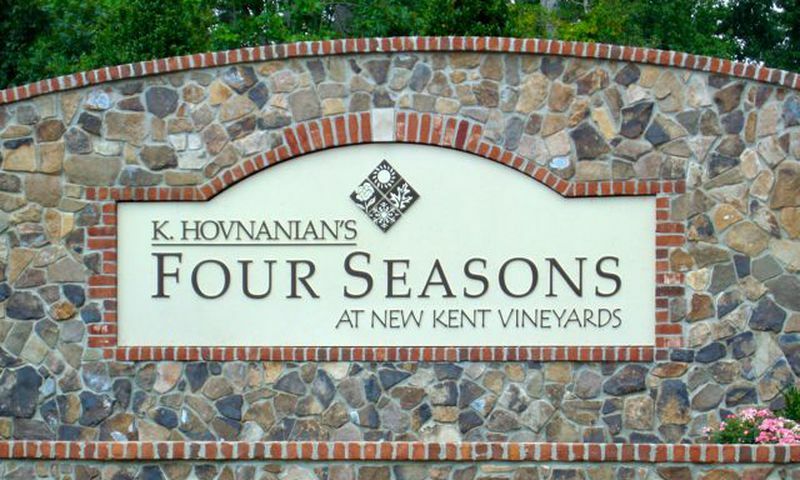 55places.com is not affiliated with the developer(s) or homeowners association of Four Seasons at New Kent Vineyards. The information you submit is distributed to a 55places.com Partner Agent, who is a licensed real estate agent. The information regarding Four Seasons at New Kent Vineyards has not been verified or approved by the developer or homeowners association. Please verify all information prior to purchasing. 55places.com is not responsible for any errors regarding the information displayed on this website.